How Much Fuel Do You Need For An Obstacle Course Race? I am always shocked when I see athletes at races with absolutely no fuel or hydration, especially at a longer race like the Spartan Super or Beast. IF you have an ideal performance diet and show up to a race with a full supply of glycogen, it only provides about 1,400 to 1,800 calories of fuel. During steady exercise at moderate to high intensity, you can burn through that in less than 90 minutes. If your diet is not ideal and you don’t pay attention to your food and fluid intake in the 4-hour window before your race, you are likely starting without a full supply of glycogen. Pre-race hydration is key, as you don’t want to be showing up to compete already dehydrated. But even if you’ve followed sound fluid strategies, you need more water during an event than you probably think you do. You should aim to consume 600 ml of fluid for every hour you’re racing. If a race is longer than 45 minutes long (and especially in the scorching heat! ), you’ll want to include a mix of carbohydrates and electrolytes. Your performance will benefit from consuming 30 g of carbohydrates per hour. More may be needed for high-intensity output or when some muscle glycogen depletion has already occurred. If you’ll finish a race in under 45 minutes, food strategies are likely not necessary. For a race lasting 45 to 75 minutes, you’ll want to consume up to 30 g of carbohydrates per hour. For an event lasting 1 to 2.5 hours, you’ll need 30-60 g of carbohydrates per hour. For any event lasting more than 2.5 hours, you will need to seriously consider your food and fluid strategies and aim to consume 80-90 g of carbohydrates per hour (320 to 360 calories per hour). 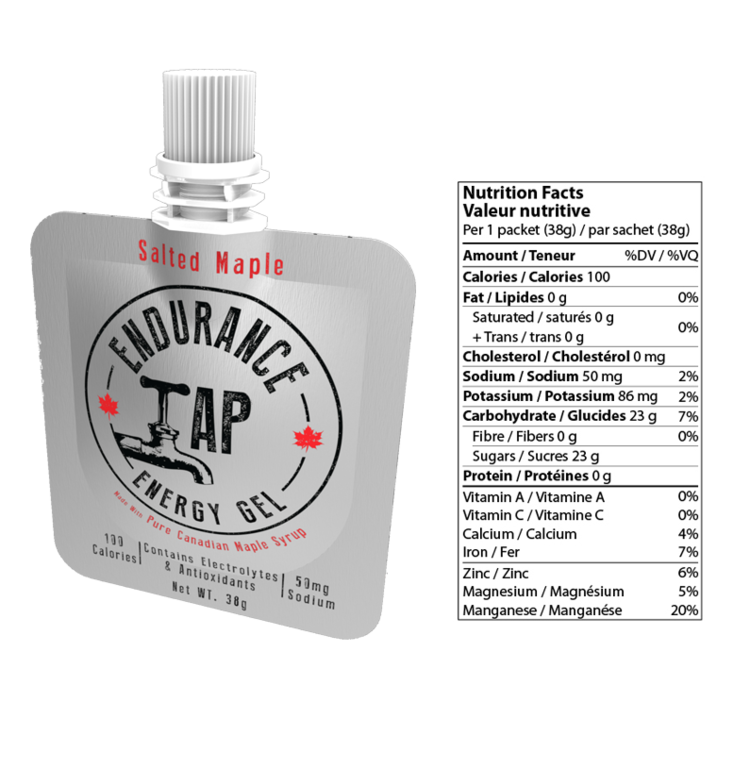 For example: 1 Endurance Tap Salted Maple Energy Gel contains 23 g of carbohydrates. You would need to consume 1 per hour for an event lasting 45 to 75 minutes. You would need to consume 2 per hour for an event lasting 1 to 2.5 hours. You would need to consume 3-4 per hour for an event last more than 2.5 hours. You likely don’t want to be sucking back 2-3 gels per hour, so you will need to consider your food and fluid strategies and plan other snacks to make up the difference. Adding a powder to your fluid would increase your carbohydrate consumption. Just make sure you use this list of best to worst sugars when making a product decision.